This is a place for personal insights into our work by Save the Redwoods League leaders. You can explore posts by category: It Takes a Forest SM focuses on League project and program updates; Off the Beaten Path gets you into the redwood forest; Redwoods Futures illuminates the issues affecting our redwood forests; and The Eighth Wonders explores the art, education, and science of the redwood forests. Please join the conversation by posting your stories and comments. Urge the 116th Congress to Renew the LWCF Today! Now that the 116th Congress has taken office, your voice is needed. Urge your Member of Congress to support permanent reauthorization of the Land and Water Conservation Fund (LWCF), America’s most useful and cost-effective conservation program. LWCF was allowed to expire last year, and so far the country has lost more than $230 million that should be used to protect redwood forests and other wildlands and make parks accessible. Did you know the ancient coast redwoods that once stood in the San Francisco Bay Area’s East Bay were thought to have been some of the largest? Now you can learn about this history and see the footprint of a giant redwood that once stood in Roberts Regional Recreation Area. The League and East Bay Regional Park District recently unveiled a permanent exhibit. What’s your New Year’s resolution? This year, Save the Redwoods League wants to help you make a resolution you can keep (in 20 minutes or less, for free). Everybody needs a legal will, but too many people put it off year after year. Make your will today, and include a gift to the League to ensure the protection of our redwood forests for generations far in the future. Nearly $150,000 in research grants from Save the Redwoods League have been awarded as part of the 2018 grant cycle. Funding these projects is a significant component of fulfilling the League’s mission, and each of these projects will contribute to scientific knowledge of coast redwood and giant sequoia forests. This research can help us answer big questions that will protect the health of people, wildlife, and the forests. Although the giant sequoia are fantastic teachers in and of themselves, as an outdoor educator, I am the lucky one that gets to share their unique story with the world. While I haven’t physically left Calaveras Big Trees State Park in the Sierra Nevada, since October I’ve connected virtually with about 2,000 students in 70 classrooms from seven countries and 18 states. As we reflect on 2018 — the Centennial year for Save the Redwoods League — I’m excited to share some of the many successes that you made possible. 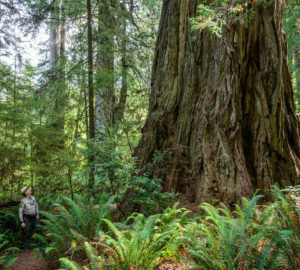 No matter what you like to do outside, an unforgettable experience awaits you in California’s redwood parks, including the four parks described here. Nothing compares to standing in the cathedral-like groves, next to trees whose beauty, age, and size are almost beyond belief. It’s no wonder Lonely Planet named the redwood forests the nation’s top destination in 2018. We can bring back the redwood forests that store more carbon than any other forest type on Earth— places that epitomize resilience when we need it most—and raise the spirits of all who explore these cathedrals of nature. Get Your Free Second Saturdays Passes for December Now! Save the Redwoods League and California State Parks are hosting the final Free Second Saturdays at Redwood State Parks event on December 8 — download your free pass now! Our hearts are with everyone affected by the devastating wildfires here in California. We watched with shock, horror, and sadness as these fires uprooted families, burned homes, and took lives. Greg Sarris, the longtime chairman of the Federated Indians of Graton Rancheria (Southern Pomo and Coast Miwok), recounts this tale in The Ancient Ones – part of a collection of essays in a new book, The Once and Future Forest: California’s Iconic Redwoods. The midterm election on November 6, 2018, held mixed results for conservation and climate change priorities, and they will have lasting impacts on our ability to protect, restore, and connect people to California’s redwoods. America’s most useful and cost-effective conservation program was allowed to expire this September, and we need your help to keep it going! For more than 50 years, the Land and Water Conservation Fund (LWCF) has helped protect wildlife habitat, build parks and trails, and connect communities to the outdoors in every county across the country – without using a single taxpayer dollar. A group of volunteers from Workday came out to Redwood Regional Park in Oakland to work with the League and East Bay Regional Park District rangers on an important restoration project.